Do you really, really dislike washing dishes? Apparently most people do… how many times have you seen washing dishes listed as the one most hated household chore? I guess I’m in the minority, because I really don’t mind doing dishes at all, and there are times when I even enjoy it. I have a dishwasher, but it is often easier (and now that I have a super energy-efficient dishwasher, much faster) to wash dishes by hand. I am convinced that it is HOW you wash the dishes that makes the difference. First (and most important), use really hot water. Fill the sink with the hottest water available… add dishwashing liquid and the dishes. Make sure that all the dishes are completely submerged in the water, then find something else to do until the water has cooled down enough so you can put your hands in it comfortably. By this time most of the dishes will already be clean, and even baked or dried-on food will come off easily. When you’re cooking or baking something, fill your sink with hot, soapy water BEFORE you start. As you finish using a pan or dish, put it directly into the hot water, because the secret to almost effortless dish washing is to never let the food dry on the dishes. By the time you are done baking, the dishes will have cleaned themselves and won’t need much more than a rinse. And finally… as soon as the dishes are clean and dry, put them away. That’s important, too! It’s amazing how a simple technique like this can make such a huge difference! I needed encouragement to get mine done today, and this did it. Thank you! Take it from an old BACHELOR — this method works! Washing dishes is one of those round-the-house chores I’ve always HATED, but because I live alone I don’t dirty enough dishes to justify getting an AUTOMATIC dishwasher. I came across your washing dishes post while I was looking for something else and thought I’d try what you said. THANK-YOU! The only way it could get easier now would be if the DISHES washed THEMSELVES! Postscript to ANYONE reading this: DON’T skimp on the HOT WATER and be sure to use enough SOAP! That’s what makes it WORK! I used to hate doing dishes. Well, I can’t say that I like doing them now. But this method sure does beat the way I used to let everything get all dried on. Thanks! I also rather enjoy washing dishes. I have other chores I dislike and postpone, though. :) I have always used this method, too. I have a big family and recently our dishwasher died. I can’t say the kids don’t mind, haha. But I think dish washing is kind of peaceful. That is basically what I do, too. It seems more efficient and I actually can get more done that way. Thanks! I couldn’t have said it better myself. I think that from youth some women are conditioned to despise dishwahing. My daughters (15 and 6 yrs old) actually have told me that they enjoy it. My six year old says “Make the water hot mommy”. She enjoys having her hands in really warm water when I let her wash small items. My oldest daughter says “Washing dishes can be relaxing and I can daydream:. These sorts of remarks make my heart sing. They also enjoy kneading bread and caring for plants. I often hear women complain about washing dishes along with a myraid of other responsibilties such as caring for their children and I feel as though they are missing out on some of the more joyful aspects of life. I have found that washing the dishes when there are small amounts is easier than letting them accumulate. I get overwhelmed easily when very many pile up. Use the hottest water that you have- pot your tea kettle on to boil if needed, then just use rubber gloves- the gloves provide enough protection from the scalding hot water, and there is no need to let it cool and have to keep adding. 2 pair of rubber gloves at Dollar General is just $1.25. Before I take the gloves off I wash my gloved hands with soap, then slip them off and hang them to dry. I have also run them through the wash with a load of towels. p.s. I have a new dishwasher, runs beautifully, and is in perfect working order, however I only run it once a week, Sunday afternoons, with the heated dry option turned off. Handwashing dishes, is faster, saves a lot of water and electricity. Our electric and water bills dropped DRASTICALLY when I stopped running it. Thank you for a very nice site with lots of interesting tips! I don’t mind doing the dishes. It’s the only task that allows me to think about other things (I don’t like chores where I have to concentrate the whole time). The hot water/soap soaking method is great after a big party, but the real trick to make washing the disches easy is to never (EVER) let it add up. A few plates, a pan and a pot and some chopsticks (we eat mainly Chinese) only takes a few minutes to clean up and there is usually no need to soak anything… Of course, in my family it’s only me, my wife and our 2 month old baby. A big family might be a different thing… Thanks for this wonderful site! This works well, I tell you. My momma and I just use hot water and wash off all the food we can first, then scrub away. But also, its easier to wash the dishes if 1) you have someone to talk to, or 2) you have a few songs in mind to sing. Really! It works so well, its kinda scary. Just start singing or talking, but continue working absentmindedly, and the next thing you know, you’ll be done! That was a very helpful tip thanks. This is the method my mom uses which she learned from my great-grandmother, a woman with 6 children and a hardworking, hungry husband, a lady who never owned an electric dishwasher in her life. My mom’s saying about her grandmother that you never found a dirty dish in her kitchen. When my great-grandmother sat down to eat, all the dishes were clean except the ones the family were ready to eat on. Because she used this method! My mother taught it to me, and I can testify it really does work. Thanks for the memories! I have a double sink with a dishpan on one side. I rinse dishes and stack them neatly in the dishpan (all plates, silverware in cups.) Then I run STEAMING hot soapy water in the other side when I am ready to wash. In the soapy water, I always place knives in the same location so no one reaches in and gets cut. Always the same system. Makes it very easy to train my children. I use antique china and silver, so I have to handwash. But I enjoy it! I have timed myself and it takes about 7 minutes to do 2 loads. When not in use, I store my dish drainer in the dishwasher. I buy with an eye towards ease in hand washing. I have found that electric skillets (stainless, not nonstick) and enameled pans like Descoware handwash beautifully. 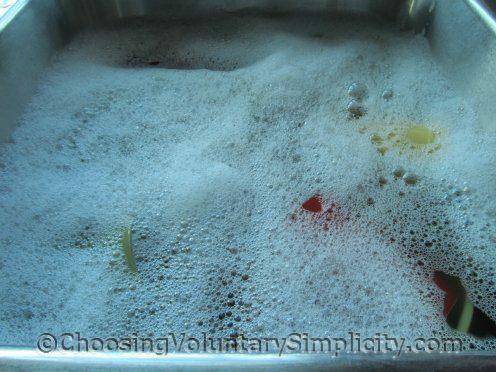 For some strange reason, as a kid, i enjoyed helping my friends wash their dishes, but when i got home, i despised doing ours. I’ve had to wash them at home, at other peoples houses, and in restaurants i’ve worked in (by hand, no machine). I finally figured out that there are 2 or 3 things that make it such agony. 1. It really isn’t so much the washing of the dishes that i hate so much as it is the putting away the clean ones! Why this is so i have never figured out. But most people hate unloading the dishwasher, so i must not be alone in this. Also, by procrastinating with putting them away it clogs the system, leaving the dirties piling up until the cleanies get cleared away. When my drainboard is clear i don’t mind zipping thru washing the dirties. 3. What i hate the most is greasy pans. I don’t eat fried foods but my husband does and he likes everything deep-fried which makes a splattered greasy mess of the entire kitchen. He doesn’t want the grease poured out of the pans, so it can be ready to use again and again so we have several sizes of pans in several degrees of overcooked smelly grease all over the stove and counter, and sometimes stored in the oven. Not only is washing dishes a chore in here but so is trying to cook in this mess. 4. Also, he is hypoglycemic and eats/snacks constantly leaving the kitchen in a constant mess all the time (and at 84 yrs old, he’s not about to change now). it goes so much faster and actually is fun when someone else is with you … the radio being a fairly good substitute when a real person isn’t available. Rain, although you didn’t ask me specifically, here is an idea for you. Set a timer and have a race with it to get the dishes all put away before it buzzes! Make it fun! I told my hubby the other night that I was going to start washing dishes by hand, and he looked at me like I had three heads. I think the diswasher is his favorite household appliance. During the week, we run one load in the dishwasher every other night, and on the weekends, every night. I figure we could save a lot of $$ by just washing by hand. I procrastinate washing dishes (“I’ll do them in the morning”). But I have learned as so many said, that a sinkfull of hot soapy water waiting to caress each spoon, dish, glass or pan is a must while cooking. As long as the counters are (semi-)cleared, the kitchen looks clean. My husband knows where the coffee cups are. Same for the plates and pots and pans WHEN HE NEEDS THEM. We have been in this house for 35 years, so how come he puts the soup bowls on the wrong shelf, and always asks where the casseroles belong, even if he was the one to take it down from the top shelf for me a few hours ago!! For 2 weeks now, I have been been on a “green drink” kick. I have a great blender that makes fruits and veggies like a smoothie. That’s been breakfast and lunch. Very little clean up. I need the fiber so juicing was out. Took a few days to like spinach, parsley, beets, and canalope for breakfast. I add powdered egg white for protein. Won’t do ginger anymore. Hubby has cereal and yogurt at home, then lunch at work. Weekends are when the dishes stay out in the open. During gardening season, I leave the dishes to wash AFTER I come in from the garden. Then I get the dishes ~ and my hands ~ clean all at once. Meanwhile, I always rinse the dishes after eating so there is no dried on food. And pans – as soon as the food is out of them, I quickly swish them with water and a little scouring pad or steel brush ball. Again, nothing sticks to them. If they are not greasy, they can go right onto to the stove to air dry til I either need them again, or can put them away – whichever comes first. I wish I had discovered decades earlier that oatmeal does not stick to pots IF you immediately wash out the pot as soon as you take out the oatmeal! Ditto for many other foods and pots. Occasionally the dishes pile up. Then I put on a good video or audio to entertain me so I don’t get mad/depressed at having too many dishes to wash at once! Then I can actually enjoy cleaning up the dishes and kitchen. I also keep a bucket next to the sink. I pour all the pre-rinse water from the plates, cups, bowls, pans, etc. directly into the bucket (instead of letting it go down the drain). This water is great for watering the plants in pots on the deck and/or in the garden. It’s full of little nutrients that increase the earthworm population – and saves wear and tear on the septic/sewer system and excessive pumping of the well system. I have a lot of plants, so sometimes I have 5-15-even 20 gallons of “kitchen water” just from pre-rinsing the dishes to feed/water my plants. I like washing dishes by hand. I HATE unloading the dishwasher. I know, that’s weird. This helped motivate me to hand wash our dishes. I now need to get hubby to check our hot water heater..had to heat really hot water in the microwave to get the water hot enough. Half of the battle is just starting ! I hate washing them..in the dishwasher or by hand. Just knowing that others are as un thrilled about washing them sort of helps too. Got them all finished and now can relax ! Good knives should be carefully washed, and of course, cast iron is never soaked. But, that’s another topic. Thanks for these tips ! Great suggestions. I find that if I keep up with the dishes in a timely manner, than the best use for the dishwasher is as a giant dish drainer. The biggest problem in our kitchen is the space to store things, so we don’t keep a separate dish drainer. Using the dishwasher instead leaves space for more fun things like baking pans!